A Piaggio scooter. 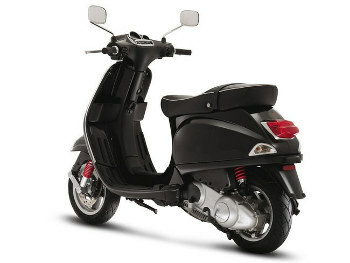 The Piaggio Group is the European leading manufacturer of two-wheeled motor vehicles. The Piaggio Group is the European leading manufacturer of two-wheeled motor vehicles and also holds an international leading role in the commercial vehicle market. With over 7,000 employees and facilities and research centers scattered over Italy, Vietnam, Spain, China, and India, Piaggio has recently been investing its efforts in the creation of a new scooter model destined for the Indian market and has chosen LMS Virtual.Lab Durability software to address engineering challenges linked to this new ambitious strategic move. Piaggio started on the project with an in-depth analysis of the Indian market demand characteristics and singled out a few key features of the "scooter to be," such as low cost, high engine efficiency, low fuel consumption, low driver-ground distance, and low engine emissions. With these guidelines, Piaggio started developing a new small displacement engine that could respond to these requirements. And when the engineers came up with a first design for the crankshaft, the system was submitted to the motor center to assess the soundness of the components. The engine center employed LMS Virtual.Lab Durability to reproduce and analyze the crankshaft subcomponents' fatigue and durability performance, using the "hot-spot" feature to single-out the "least safe point" of the system. The engine center employed LMS Virtual.Lab Durability to reproduce and analyze the crankshaft subcomponents' fatigue and durability performance, using the "hot-spot detection" feature to single out the most critical areas of the system. The results highlighted a spot next to the contact surface between the crankshaft and the crankpin. 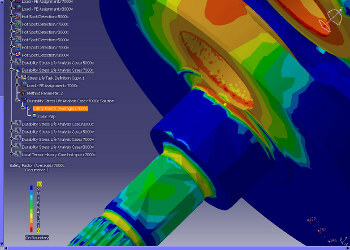 Using Virtual.Lab's damage contribution analysis demonstrated that the crankshaft/crankpin interference fit was the main source of fatigue damage. This information showed Piaggio that design variations on this assembly were delicate and could affect the whole crankshaft performance. Virtual.Lab's output data on this spot were then compared to Piaggio's standards: the conclusion was that, with the current design, all crankshaft components, including the hotspot, satisfied Piaggio safety factor criteria. "But what would have happened to the crankshaft's performance, and in particular to our hot spot, if -- without simulation analysis -- we had decided to slightly change the design of one of the system subcomponents?" asks Engineer Riccardo Testi, a long time Virtual.Lab user from Piaggio's motor center division. 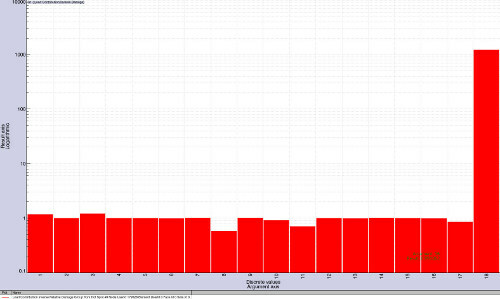 "Virtual.Lab provided us with the answer to this question, as it helped us calculate the impact of all neighboring components on the system and pinpoint the highest load channel in the system." Virtual.Lab helped Piaggio calculate the impact of all neighboring components on the system and pinpoint the most damaging load channel in the system. Finally, the initial crankshaft design was maintained, and Piaggio moved on to finalize the scooter project. "Use of LMS Virtual.Lab Durability in Piaggio cut the number of required prototypes in half, effectively reducing the development cycle," says Testi. Piaggio has been an LMS tool user for many years, and the motor center division has just recently added LMS Virtual.Lab Motion to their virtual simulation portfolio for effective analysis and optimization of real-life performance of their mechanical systems. "LMS is a great partner," Testi says. "What we also strongly valued in LMS during the benchmarking process of LMS Virtual.Lab Durability was their responsiveness in adapting the tool completely to the existing development process."